Delft, a hand-cut cut jewel glass mosaic, shown in Opal Sea Glass with jewel glass Lapis Lazuli, Iolite, and Covelite, is part of the Sea Glass Collection by New Ravenna. As Dutch and British merchants explored the Silk Road trade routes into Asia, examples of China’s “exotic” decorative arts begun filtering into the Netherlands and England. The Dutch started importing Chinese porcelain in the early 17th century followed by the British about eighty years later. 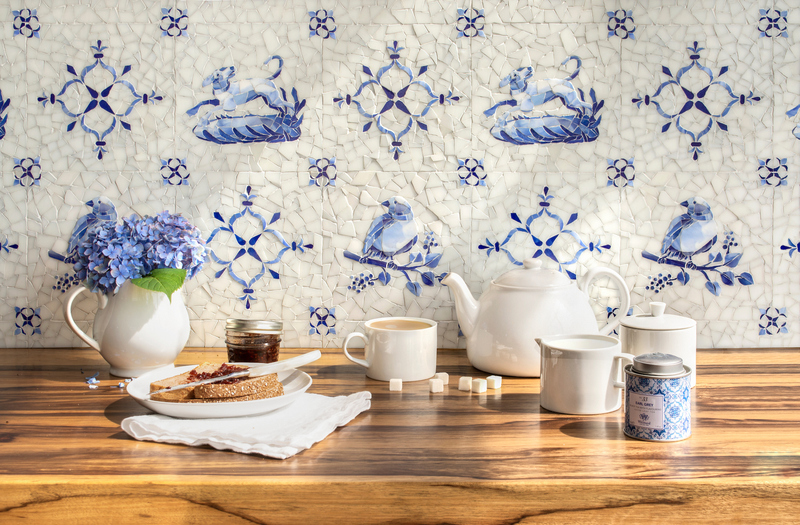 Dutch Delftware was the first interpretation of Chinese porcelain – the fresh blue and white colour combination we now identify as “delft” is a reflection of the simplicity in design, which moves easily between traditional and contemporary interiors. Blue and white is a soothing, effortless combination, it speaks of brisk Northern European climates as well as warm Mediterranean beaches. As a decorative motif, it works for both kitchen and bath, as the color blue’s strongest association is that of water. Continue reading the article on Utopia K & B Mag.